Researchers: J. C. Báez, F. Leyton, C. Troncoso, and F. del Campo, Centro Sismológico Nacional; M. Bevis and E. Kendrick, Ohio State University; C. Vigny, Ecole Normale Superieure; M. Moreno, GFZ Helmholtz Centre Potsdam; M. Simons, California Institute of Technology; H. Parra, Instituto Geográfico Militar; and F. Blume, UNAVCO. Chile is prone to large earthquakes and damaging tsunamis. Significant effort continues to prepare for, warn and respond to these events. Global Navigation Satellite Systems (GNSS) networks have been established and enhanced to provide information and warning about large earthquakes and tsunamis. The Centro Sismológico Nacional (CSN) of the Universidad de Chile can collect information about an earthquake and potential tsunami from GNSS data within seconds and provide early warning to communities in Chile and the rest of the world. Chile is a seismically active country with a long coastline and a high mountain range. The country lies near a major plate boundary where the Nazca Plate is subsiding beneath the South American Plate, creating mountains, volcanoes, earthquakes, tsunamis and landslides. Magnitude 7+ earthquakes are all too common and the largest historical earthquake ever recorded was centered near Valdivia, Chile, a magnitude 9.5 in 1960. For the past few decades, Chile has been deploying and upgrading a geodetic network with help from the U.S., Germany, France and others. UNAVCO supplied instruments for the California Institute of Technology to set-up a geodetic array of 40 continuous GNSS stations in 2010 and Chile has added another 130 GNSS stations since 2013. The Centro Sismológico Nacional (CSN) and others initially used the geodetic data for deciphering plate motion and interseismic deformation. Now the network provides useful information about the complete seismic cycle. With many 7+ magnitude earthquakes in the 21st century, CSN and others have analyzed their ability to provide early warning utilizing geodetic data. 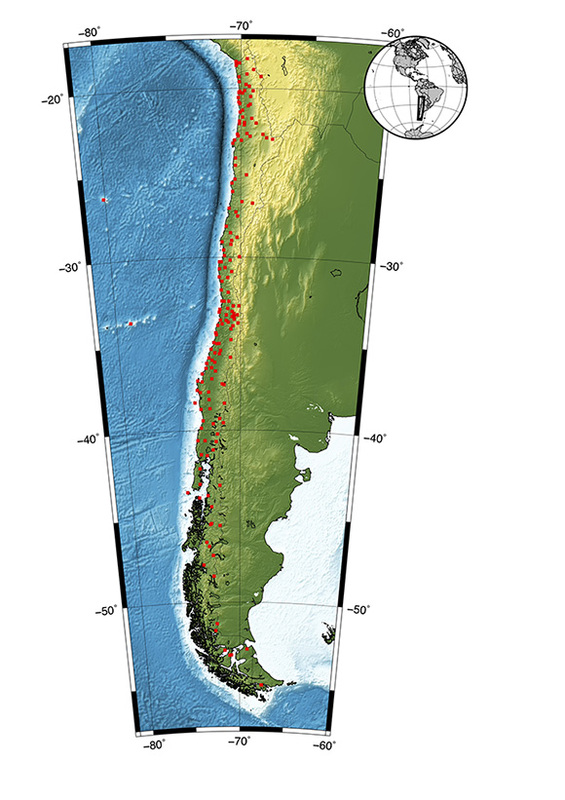 The GNSS network in Chile can be used to determine the magnitude, fault mechanism, amount of shaking and potential tsunami wave generation within a few seconds to minutes for earthquakes of magnitude 7 or larger. The GNSS stations need to be operating in real-time and have robust communication channels for any early warning system to be efficient. Chile has advanced their research, technology, infrastructure and communications to enhance their early warning systems with GNSS and help to reduce risks from these anticipated hazards. The Chilean GNSS Network: Current Status and Progress toward Early Warning Applications J. C. Báez et al., Seismological Research Letters (2018) 89 (4): 1546-1554. doi: 10.1002/2017GL076054.